In the future novel optochips that combine lasers with electronics will dramatically reduce the size of technology devices (Holey Optochip image courtesy of IBM). Research into a new type of laser will dramatically improve future devices used for sensing and in communications, according to scientists at the University. In a paper recently published in Physical Review B, researchers from the Department of Physics demonstrate their work into bosonic lasers which emit terahertz radiation. Such lasers have been around for years, commonly found in satellites, for environmental monitoring, astronomy, security and non-destructive testing, imaging, and medical applications. But they are considered bulky, impractical and expensive. Through this latest study, the researchers demonstrate how such lasers could be exploited to improve their performance and, potentially, lead to the miniaturisation of future technological devices. The research showcases how, in the future, new 'bosonic lasers' emitting terahertz radiation could be fine-tuned to vary or minimise the power required by the laser or to alter the intensity of terahertz radiation. Scientists are excited by terahertz technologies as they provide unprecedented sensing capabilities across biology, pharmacy, medicine, material science, environment monitoring, security, astronomy and communications. From DNA chips, to skin-cancer diagnosis, laser surgery to explosives inspection, there are numerous potentials across every field. Information and communications technology also benefits from terahertz technology, including for wireless communication, high-speed data processing and satellite communication. The 'bosonic laser' emits not only terahertz radiation but also visible blue light in the same direction, allowing it be used as a surgical instrument. With visible light serving as guide to direct the radiation beam, surgeons would be able to perform precision surgery. The Terahertz range on the electromagnetic spectrum. Dr Gabriela Slavcheva, from the Department of Physics, said: "There are no such similar resources currently available and this research really opens up the way for new applications in medicine, biology, security, sensing and in high speed computers and high speed communications. "The bosonic terahertz laser will work in tandem with a conventional light emitting diode (LED), which is a completely new approach. 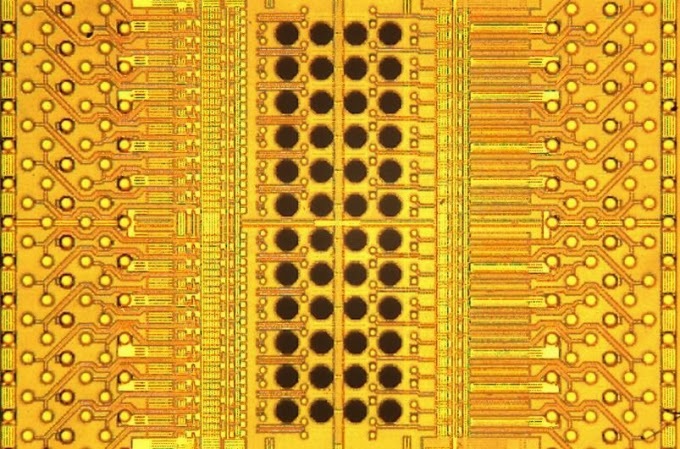 This will enable the miniaturisation of new optochips which, in turn, will help develop a whole new class of novel devices and applications." The next stage of research is to improve the efficiency of the lasers. These sorts of experiments are currently under way in the US, France and other countries and there is currently fierce completion to develop the technology.